Neil M. Gunn (1891–1973) has been widely recognized as the most important novelist of the twentieth-century Scottish Literary Renaissance. Most of his novels are still in print and they continue to find in each generation an enthusiastic popular and academic readership. His novels have been adopted for cinema, television and radio and they have had an important influence on contemporary Scottish writers such as James Robertson. What is perhaps less well known is Gunn’s role in the development of contemporary Scottish nationalism as both activist and thinker. Not that he would have agreed to such a division as he believed in a seamless commitment to the goal of a fairer and more equitable Scotland through the delivery of election leaflets and the setting out of the intellectual case for independence. Gunn was instrumental in the foundation of the contemporary SNP, through the bringing together of disparate groups in favour of independence, and continued to play a part in its development and in the development of the Highlands and Islands throughout his life. This collection of essays on Gunn’s involvement in politics and his ideas about nation and nationalism represents a guide to both for the reader of his novels and those interested in contemporary political developments in Scotland. Alistair McCleery draws parallels between the situation in 1931, using Gunn’s account of it in his diary, and the present day. 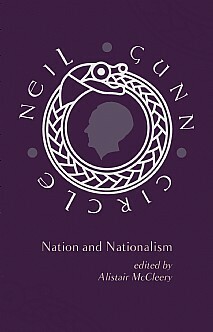 Michael Russell, Cabinet Secretary for Education and Lifelong Learning, examines Gunn’s debt to Ireland, the role of the writer in nationalism, and the need for Scottish literature within the Scottish curriculum. Ewen Cameron, now Professor of History at Edinburgh University, considers the gaps in his own school education in the Highlands and how he was led to fill them through an enthusiastic teacher leading him to Gunn’s novels and thereby to the history and culture of his own locality. Dairmid Gunn draws on his intimate knowledge of his uncle to provide an account of his home in Inverness as a centre for lively company and stimulating discussion of art and politics. This picture is reinforced in the late Neil MacCormick’s memoir of Gunn and the influence he had on John MacCormick, his father. The collection also contains two of Gunn’s essays on writing and politics as well as a complete bibliography of his political writings by Christopher Stokoe. The collection as a whole is timely in its contribution to understanding of Scottish nationalism just under a year before the Scottish people come to decide, as Gunn hoped they would have the opportunity to, on Scotland’s future as an independent state or not. Sure to be of huge interest to all those who appreciate good writing and collectors of Neil M. Gunn’s work. It is an invaluable guide for everyone interested in the current Scottish political debate such as academics and students of the politics of Scotland.